Chances are that few people predicted “.xyz” would be outperforming the likes of “.nyc” and “.guru” when the new generic top level domains (gTLDs) were first announced in 2011. Fast forward to Feb. 2015, however, and .xyz is the only public gTLD to exceed 750,000 registrations. In fact, data from nTLDStats.com shows that .xyz has nearly double the market share of other gTLDs. 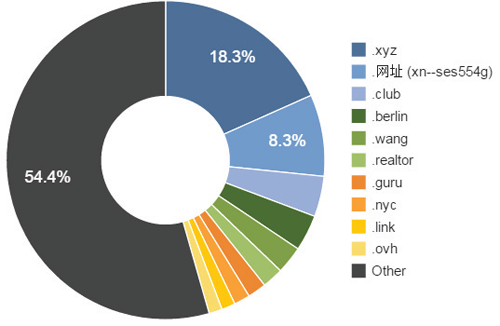 Comparatively, the Chinese extension “.网址” (xn--ses554g) has more than 350,000 registrations, followed by “.club” with 177,000-plus registrations, “.berlin” with roughly 155,000 registrations and “.wang” rounding out the top five with more than 120,000 registrations (see image below). It is important for Web professionals to keep in mind, however, that the domain industry will have more than a few shakeups as new domain extensions emerge into general availability. Additionally, just because a certain domain currently has the highest registration rate, doesn’t mean that it will be successful long term. The .xyz extension, for instance, has seen an infl ux of registrations likely due to suspected strategic promotions from certain registrars. With these promotions, some registrars are rumored to have provided customers with complimentary .xyz domains. Take Network Solutions as an example. More than 89 percent of the company’s new gTLD registrations are for the .xyz extension. Curiously, .xyz launched on June 2, 2014, and that very same day Network Solutions’ registered 17,791 new gTLDs (see image below). Similarly, more than 81 percent of Xin Net Technology Corporation’s registrations are also for the .xyz extension. Xin, however, didn’t have the same registration spike as Network Solutions on June 2, but the company did see a dramatic spike in gTLD registrations a couple months later. It is likely that both of these registrars had a hand in inflating the .xyz extension’s numbers through some type of strategic promotion. More importantly, though, is the fact that this data validates that it is too soon to predict how successful a new gTLD may become, as registration numbers don’t always paint a complete picture. Perhaps the best way to gauge the success of new gTLDs is by thinking practically and identifying which extensions will end up resonating best with their audiences in the years to come. Although “.com” remains the most dominant domain in the U.S., consumers are warming up to the idea of new domain extensions. A recent study from the Domain Name Association reveals that while 86 percent of U.S. respondents would prefer pre-existing generic and country code top-level domains (ccTLDs) when it comes to shopping online, 14 percent did say, however, that they would shop with a retailer who has a new gTLD. That said, respondents in many of the other countries were more evenly split, with 49 percent of Australians noting that they prefer pre-existing generic and ccTLDs and 51 percent preferring new extensions. For retailers, this suggests that city-name extensions could be an area of opportunity, as these domains have the ability to provide a sense of authority to consumers looking to shop locally online. In all, there were more than 300 new TLDs launched in the market in 2014, and even more are expected to be released in 2015. By keeping up with adoption trends, Web professionals will be better equipped to evolve with the market instead of having to play catch-up. Only time will tell which extensions will resonate with consumers. Even so, many of the new extensions provide unique opportunities for businesses to personalize, localize and humanize their brands – even if consumer adoption is still a few years off.